Delamination means separation. With its numerous layers, plywood is prone to delamination if proper manufacturing processes are not observed. Other plywood separations can be blamed on mistreatment of the plywood, or failure to practice good woodworking techniques. Plywood nailed to a wooden floor. Plywood is a sandwich of thin veneers glued together with heat; the more layers the better. Five layers are considered acceptable. Nine or more layers are considered exceptional. Veneer layers are positioned so that grain patterns run perpendicular across each adjacent layer. Plywood is designed with an unequal number of layers, placing equal stress on a center layer, balancing the plywood. The overlapping layers combined with the balance in the center makes plywood stable. When plywood is manufactured under perfect conditions, issues of delamination are kept at a minimum. Good glue coverage is essential to prevent delamination of layers. Even the best manufacturing equipment malfunctions or fails to spread glue thick enough between layers. In some instances it's to the contrary -- too much glue can be the problem. Thicker glue layers can crystallize and shatter. Too much or too little glue during manufacturing is a common cause of plywood delaminations. Other glue-related causes can trace back to bad glue used by the manufacturer. Glue can spoil, retain too much moisture or get contaminated, causing it to fail after you use the plywood. Blows are a woodworker's term that refers to hollow spots or voids inside plywood. This type of delamination occurs on plywood when heat during manufacturing causes moisture to turn to steam. This causes a pocket or cavity that you can't see until you cut the plywood. You can detect blows when you're handling the plywood, or when you slide your hand over the plywood. If you hear a hollow sound, it's likely to be a blow in the plywood. Reject it or cut around it if possible. Damage to the edge of the plywood allows moisture to penetrate into the layers, and can cause separations. Even if the plywood is rated as exterior-grade and manufactured with water-proof glue, if water penetrates between layers, it causes them to swell and warp, pulling the layers apart. Delamination starts along the edge and progresses to the interior of the plywood over time. Edge damage often occurs when forklifts attempt to pick up the plywood. If you notice dents or gouges in plywood, don't use it. Nails or screws too close to the edge can cause plywood delaminations. The pressure from a nail or screw bends the ends or sides of the thin layers up or down, separating them just enough for moisture to penetrate between them. In time, the separations swell as the delaminations get worse, and migrate into the interior of the plywood. Never nail or add screws to plywood less than 3/4 inch from any edge or corner. Hardwood plywood has a paper-thin veneer layer of hardwood on both sides that can be prone to separations during handling. In some instances, the paper-thin veneer hooks on clothing, other pieces of wood or equipment and lifts the veneer, separating it from the core. If you have no other choice and have to use plywood that's partially delaminated along the edge or corner, you may be able to fix it. Some separations can be glued back into place. Apply white glue to the blade of a putty knife and slide it under the delaminated layer. If it's only a slight crack, pry it open slightly with a putty knife and inject glue directly into the crack or separation. Clamp the crack shut using scrap blocks to protect the finish. It some instances, dealing with small separations is no big deal. 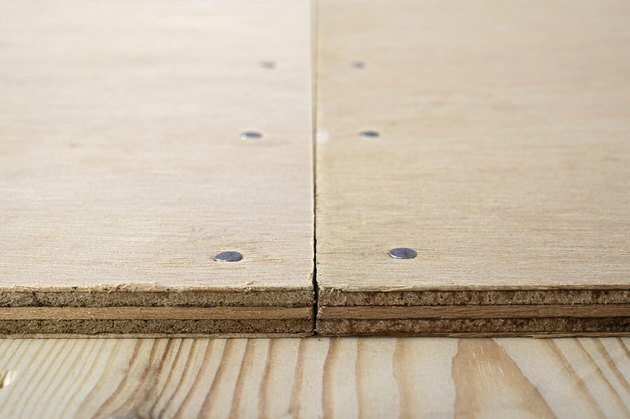 What Is the Difference Between B-C & A-C Plywood?